The wonderful Admin Drop Down Menu comes with a cool set of hooks that will allow plugin coders to hack everything to death. 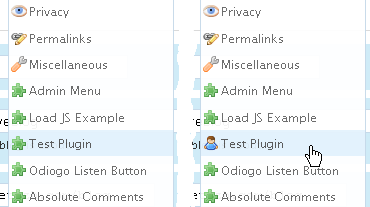 All the plugin have, by default, a cute green plugin icon. But your plugin is special, right? It deserves its own icon! And that's all. The trick is simply to hook into ozh_adminmenu_icon_[your_plugin]. Third party plugins can modify the menu or its entries, with the help of the almighty add_filter() function. Note: I'm not providing any help on this, as it implies you know what you're doing, how you'll do it, and why you need to do it. The main function of the plugin is wp_ozh_adminmenu() which builds a new $ozh_menu from WordPress' $menu and $submenu. Wow man, this is simply amazing…wondering if it can get any better than this!!! :). Jokes apart awesome work man! I write Subscribe2 and use your API to use a custom menu icon – but it's stopped working. Now I thought it might be me or a new API change but Google Sitemaps is having the same problem on my site. You aware of any issues? I'm using WordPress 2.8.4 and version 3.3.2 of Admin Menu. Matt » Yeah indeed the hook has changed in a recent version of WP, totally forgot to update the doc, thanks for the reminder :) I'm updating it right now! You should use something like "ozh_adminmenu_icon_my-plugin/my-plugin.php" as a hook name. Is there a hook to disable the menu on the fly? I have a popup page where I don't want the admin bar to appear, but I want to keep it active on the main pages. LAFFO! Nevermind. It's late and I'm on the wrong plugin page. All apologies. Awesome plugin. I'm using it on a big site for an organization that requires lots of menu items (two or three rows worth) and I am having trouble getting the CSS to make the blend background show on rows under the first row. I should mention I am using your plugin on WP 3.0 beta, and in regard to that I am using a child theme of Twenty Ten. So far it's CSS only, but I could add something to functions.php eventually. I was not able to get the child theme's CSS page to affect the admin menu, but I edited the plugin directly and got done what I needed to do. Thanks again for a great plugin! Doug » not sure what you're trying to do. Screenshot? Thanks for replying! The screenshot below shows a tweaked combination of your Admin Menu plugin PLUS the Category Write Panels plugin. At this point all I really need help on is knowing how to add a menu choice to an existing menu, preferably in a way that will survive updates, but OK if not. I have read your posts about how to do it, but I am such a newbie I am having trouble figuring it out. Thanks! I am trying to do it with a filter, but I searched everywhere for the source code to a function called wp_ozh_adminmenu_build() and cannot find it. Is there an API download that is separate from the plugin? I am an experience programmer, but all my experience is in other (older) languages. I am green and new when it comes to PHP and WP. However, I am learning quickly. If I need to create a simple plugin just to get the job done, I will do that. Has the structure of the plugin changed since this was written? I can't find the function wp_ozh_adminmenu_build() anywhere in the source. I'm looking for where to add a filter that can rearrange menu items before the menu is drawn. Thanks for all your work, Ozh. Peter Grandstaff » Oops, indeed, don't remember when but at some point I have reworked the main function and dropped the filter. Going to push an update with those filters back. Peter Grandstaff » Indeed, things were removed in november 2008, oops. I've updated the API doc page and just committed new filters. Wow, that was fast! Thanks much! I hate plugins that add a whole new menu entry for just one page… now I can fix that without breaking on upgrade. I'm also tempted to try a semi-mini mode, display only 4 characters of parent items or so. I tried all of these below but none of them work.